Tommy Emmanuel is one of Australia's most well-loved musicians worldwide. The guitarist currently lives in Nashville, Tennessee thus he was playing to a hometown crowd on February 17, 2018 when he triumphantly returned to the Ryman Auditorium. Tommy had headlined at the revered venue for the first time in 2016. That concert was documented on 2017's Live! at the Ryman. 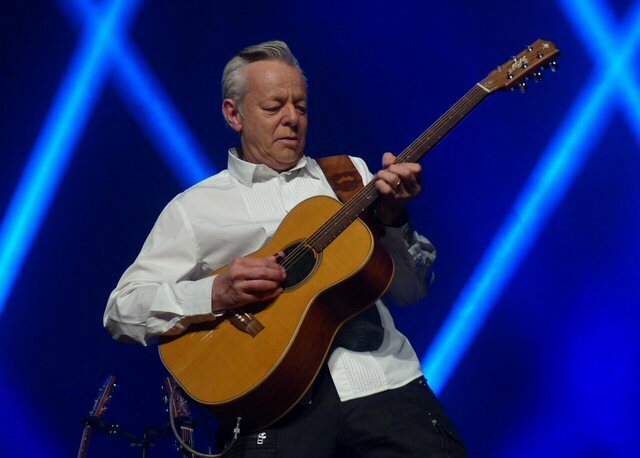 Tommy Emmanuel made a triumphant return to the Ryman in 2018. In addition to promoting the live record Emmanuel is touring in support of Accomplice One. On this sixteen track album Tommy performs with some of the most talented people from across the musical spectrum - a lineup including Jason Isbell, Mark Knopfler, Rodney Crowell, Jerry Douglas, Amanda Shires, Ricky Skaggs, J.D. Simo, David Grisman, Bryan Sutton, Suzy Bogguss and more. The CD is a mix of favorites and originals running the range from blues, country and rock. Over the course of his five decade career Tommy has earned numerous accolades and awards including the rare title of Certified Guitar Player (CGP) from the late yet still legendary Chet Atkins whose influence is still very much present in Music City. Emmanuel is a fluid fingerstyle guitarist who can play not one but three segments at once. He enthralled fans with his strumming and style as he explored blues to world. Tommy's stage set-up at the Mother Church was simple with a few amps and two acoustic guitars. Emmanuel walked out armed with a third to present a piece of peppy picking to kick things off. More multi-part melodic music followed. Emmanuel mentioned Accomplice One before handling all of "Deep River Blues" which on the album features Jason Isbell on vocals. Next, we traveled to Kentucky with Tommy as he presented a rousing round robin all by himself which earned him one of a number of that night's standing ovations. Throughout the evening, Tommy presented the new material with a number of special guests assisting. Jack Pearson who also has a spot on Accomplice One was well received as the two traded licks on the Allmans' "Midnight Rider." 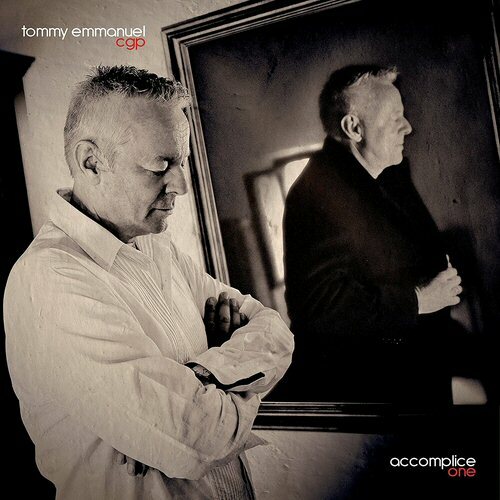 Accomplice One - "my chart topper" joked Tommy was a big part of Saturday's set list but so were some of the pieces Emmanuel has made his own over the years such as a graceful "Amazing Grace" along with a colorful "Over The Rainbow." Throughout the show lighting was used to full effect enhancing Emmanuel's layered muse. During a number of Irish inspired instrumentals green lights were utilized adding to the magic. Towards the close of the concert Tommy thanked his team, the crew at the Ryman and Chet Atkins who helped Emmanuel fulfill his dreams. Tommy's triumphant closer was an agile, effect heavy instrumental on the acoustic. Accomplice One features an accomplished cast of characters. Jake Shimabukuro is a wonder, a curiosity and perhaps a novelty but all in the best way. He emerged from Hawaii having picked up the ukulele at the age of four and has gone on to single-handedly make the baby brother of guitar actually seem cool. Jake is a literal poster boy for the instrument and music stores here in Nashville have trouble keeping the adorable tools of musical accompaniment in stock. Of course, not everyone will be able to play like Shimabukuro who has been referred to as the Hawaiian Hendrix. It is likely that some folks at the Ryman did not know who Jake was but by the end of his opening slot it is likely he had won some new fans. Saturday it was a listening crowd thus Jake fronting his trusty trio was able to strut his stuff to an attentive audience. Shimabukuro opened with an innovative take on The Zombies "Time of the Season" then meandered through more melodic structures before saying hello and declaring this is amazing as he thanked his hero Tommy Emmanuel for the opportunity to play at this historic hall. Their interpretation of "Eleanor Rigby" ran the range from sensitive to soaring. Next, Jake presented a Hawaiian song entitled "Kawika" that traversed traditional and some not so traditional sounds. It won the trio a standing ovation. "This is one of my favorites," shared Jake as they put forth a heavenly version of Leonard Cohen's "Hallelujah" where Jake played what would have been the vocal sections on the ukulele. They were also just as creative on a Hendrix cover and the closer a challenge version of Queen's "Bohemian Rhapsody" where Shimabukuro asked the crowd to sing Freddy's parts which they did. Prior to the song he said it was a dream come true to play here as he thanked Emmanuel who had helped him earlier in his career. Jake said Tommy was like a big brother to him. Earlier during Jake's guest spot with Tommy, the two jammed on The Beatles "While My Guitar Gently Weeps" with each taking a turn at the leads and then presenting "Rachel's Lullaby" from Accomplice One. It was a sweet instrumental that Tommy had penned for his baby daughter. In some ways that moment was a reminder that "the circle cannot be broken" as new generations of mentors with their prot�g�s grace this scared stage. Emmanuel asked Jake is this your first time before stating it will not be your last. We sure hope to see both the master of the six string and the four string back at the revered Ryman soon. The Ryman Auditorium in Nashville is the Mother Church of Country Music but she continues to host an array of artists such as Tommy Emmanuel and Jake Shimabukuro. The venue reflects its rich history with wooden pew seating paired with modern lighting and sound. Some consider it one of the best sounding rooms in the States. Upcoming events at the Ryman include Tedeschi Trucks Band, Dan Auerback, Noel Gallagher, Why Don't We and Opry Country Classics. 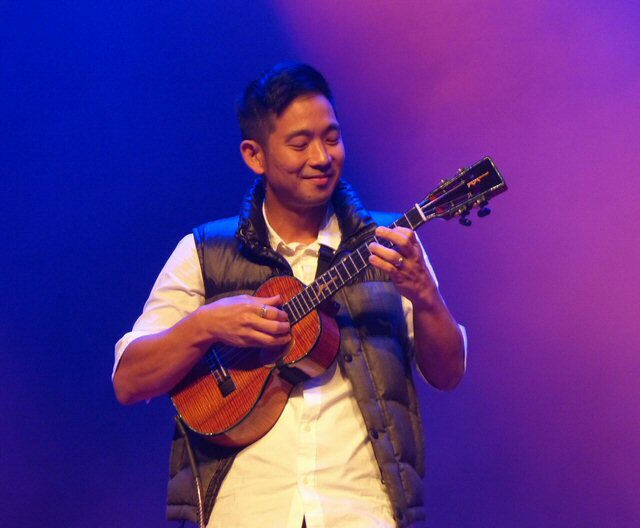 Jake Shimabukuro won over the hearts of the faithful at the Mother Church.